Angels In Hiding: Alien Gut Smoothie- Yummy! "Research has shown that you can keep your digestive system in good health by eating a balanced diet and consuming products which contain Yakult’s beneficial bacteria strain, Lactobacillus casei strain Shirota. Lactobacillus casei strain Shirota reaches the intestines alive and produces lactic acid, a substance which promotes regularity through intestinal balance. "Yakult" is a quality source of Lactobacillus casei strain Shirota. 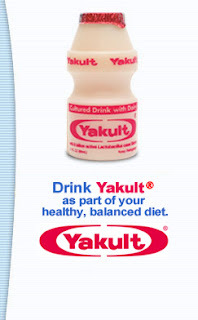 In fact, each bottle of "Yakult" contains over 8 billion of them to help keep you regular. However, along with the daily consumption of one bottle of "Yakult" recommended by company founder Dr. Shirota, be sure to drink plenty of fluids and observe a diet that is rich in fiber." apples, bananas, pineapple, mango, kiwi, broccoli, spirulena, spinach, blue green algae and garlic. Sounds gross... tastes awesome! I mix in one whole banana for added flavor and consistency and a bottle of Yakult. Add ice and any other fruit your child likes, then blend. Daniel named it Alien Gut Smoothie because of the green color. Try it out with your kids and let them name the drink. Just be sure not to let them read the ingredient list! Kadi that sounds really good! Try frozen berry blend (cherries, strawberries, blackberries and blueberries) from Trader Joes blended with almond milk (no dairy!) and bananas, I add protein and phsyllum husk too! ohhh, that sounds yummy! Daniel loves berries and almonds!